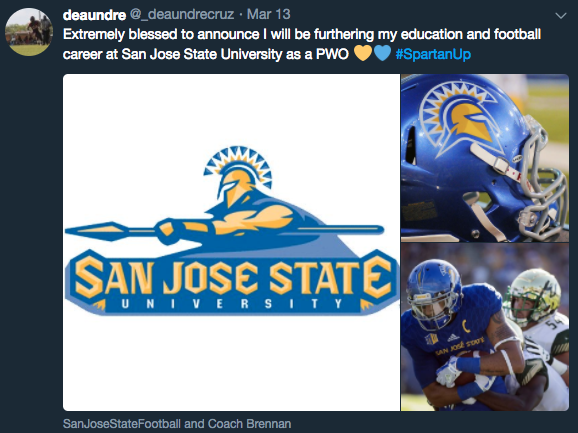 FD Friar senior De’Aundre Cruz had a strong feeling San Jose State University was where he wanted to go to college, but the acceptance letter he received last week after applying in December all but solidified his decision. Cruz broke the news on Twitter Wednesday evening that he will be joining San Jose State as a Preferred Walk On (PWO). De’Aundre had visited the San Jose campus over summer and had a great meeting with some of the coaches. After the 2017 season where the Friars completed a football undefeated three-peat, Cruz was contacted from San Jose’s Head Coach Brent Brennan and was told that the program wanted Cruz to attend. The only issue is that they had already handed out the maximum number of scholarships, but offered Cruz the opportunity of a PWO. “I’m not too familiar with their program and I didn’t really follow them until I had made the visit over summer. [Brennan] is in his second year as head coach so I know they’re probably getting used to a new system,” said Cruz on his familiarity with San Jose football. But coming in as a PWO isn’t affecting Cruz’s confidence to succeed. “I’m not that nervous going in because coach said I have a spot waiting for me, but that’s not going to stop me from competing and growing on their depth chart,” said Cruz. The immediate reaction from family and his Friar coaching staff was nothing short of positive. “They are all proud of me and wish me the best. They want me to represent Guam to the best of my ability,” added Cruz. And of course, Cruz’s friends are already notarizing their claim to fame. Cruz will be training in Hawaii with Coach Chad Ikei in June before joining Coach Brennan and the Spartans in July.